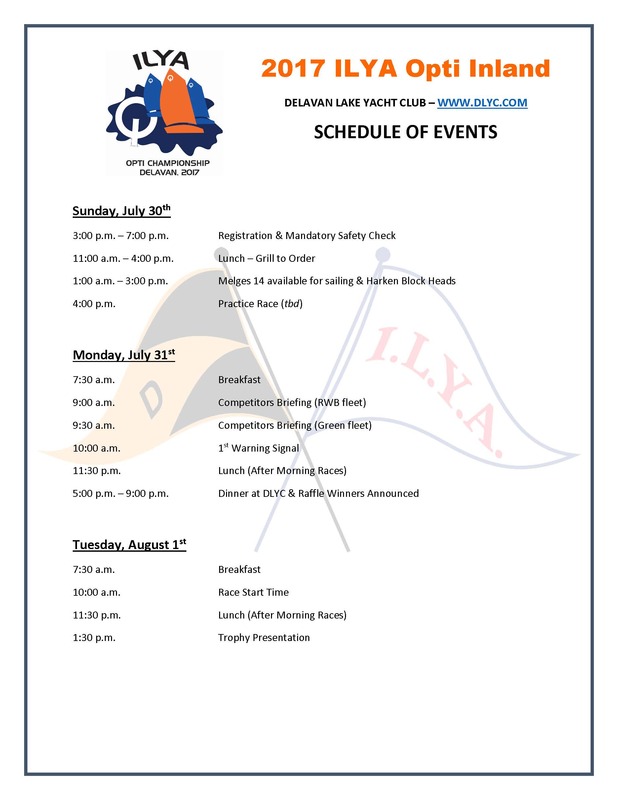 DLYC Regatta Registration for Food Packages, Shirts, etc. Regatta shirts can be ordered on the above DLYC Regatta Registration form. Raffle tickets will be available online & at registration for many cool items, including a new Opti sail! All proceeds go to the Delavan lake Sailing School. Rooms are filling up fast, please visit the DLYC home page (under the Lodging for DLYC Regatta's tab) to review the list of hotels in the area. If you are planning to stay at Lake Lawn Resort, your room had to be booked by June 25th to take advantage of the regatta room block. The Schedule of Events for the regatta is listed below. For those looking to help with the regatta, the following button is to an outline of duties for the various committees. If you are able to volunteer, please sign-up using Sign-up Genius link www.signupgenius.com/go/60b084eaca82c7-dlyc or contact the regatta chairs Scott & Tina Hetzler at hetzler@sbcglobal.net and Ed & Renee Clair at clair_renee@hotmail.com.